This book review can also be found on The Scriptorium. When you first read what The Therapist’s Cat is about, you automatically think ‘sounds funny, light-hearted, I’ll give that a go’, but underlying all the humour is a very serious message. This message speaks of responsibility and cause and effect, and it is one that reminds us that animal cruelty and not showing enough respect for the natural world can have serious consequences. Pete is bi-polar. He is also a psychotherapist. His life changes quickly after being diagnosed with, and then subsequently overcoming cancer, which he celebrates by heading out to the Himalayas, where he meets Emmie with whom he begins a short-lived romance. Once the relationship ends, Pete is left with a cat Emmie brought home. Pete doesn’t want a cat – he much prefers dogs. However, this fabulous cat, named Moo, is a therapist of sorts too, and the relationship between Pete and Moo blossoms. He soon finds out that he can communicate with Moo and she begins to teach him about evolution and the sad state the world has fallen into. “Each life form sees God in their own image. whereas we cats see God as a Super Cat. This book is available as a paperback and ebook from Soul Rocks. This entry was posted in On My Travels and tagged book review, books, Stephanie Sorrell, The Therapist's Cat. Bookmark the permalink. 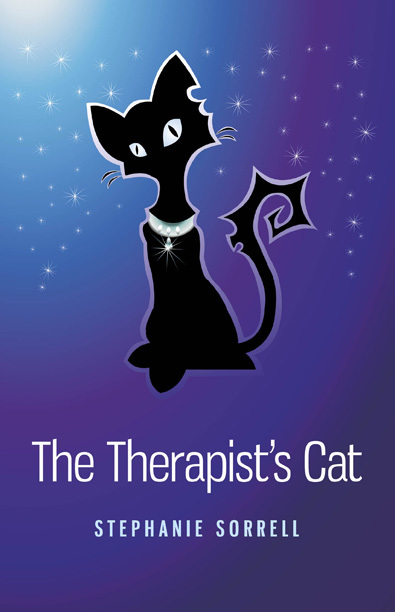 Thanks Sammi for so kindly taking the time to review my book, The Therapist’s Cat. Your review was very concise and conveyed the message so well. But I cannot take credit for it all, the real author was Moo. ‘She acosted’ me on the train to and from work, telling me in no uncertain terms thaat she wanted to convey her message to the world. Her spirit came to me six months after she had passed away.. The message, although told with humour, is dire at this time in our evolution. We cannot move forward or have an end to war until we stop mis-treating animals as it impacts on our spiritual and psychological evolution. We forget we are human animals and therefore have a responsibility and deep connection with our non-human animals….. I am led to your site because the cover of this book caught my attention. I love cats–they’re my favourite animals! Your review is very well-written. It made me intrigued by this book. I think I’m going to hunt this book. Thank you for sharing your thoughts and this novel.